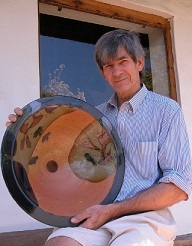 Accomplished artists Durban international ceramicist Andrew Walford together with Gohla & Neudecker who makes custom-made heirloom masterpieces out of wood and metal; Joanina Pastoll and her exquisite hanging chairs and Eicke Schmidt’s hand-crafted Jewellery will have a joint exhibition in Saxonwold, Johannesburg. The official opening of this Joint Exhibition of Accomplished Artists will be officiated by Terence King with snacks on July 27th at 17h30. The exhibition takes place from July 27 to 29 from 10h00 to 17h00 daily at 17 Griswold Avenue (off Oxford Road), Saxonwold, Johannesburg.